The crowded compositions with rather stiff figures, mainly seen in profile, are related to the St Albans Psalter, executed c. 1120-30 at St. Alban Abbey, now in the Dombibliothek in Hildesheim. The stylistic and iconographic relationship of ivories and manuscripts illustrates well the close connection between works produced in different media in one place. A second comb, in the Musée de la Princerie in Verdun, was probably executed in the same workshop but by a different hand. The unusual prominence of the scenes of the Massacre of the Innocents, the Adoration and Dream of the Magi and the Last Supper is striking, and was probably the result of a directive of the patron. 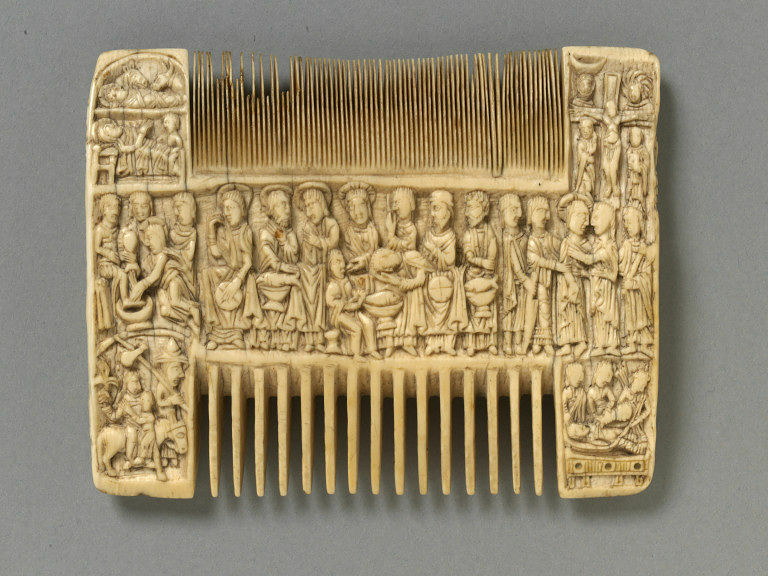 Liturgical combs were used by priests or bishops for liturgical functions. Its use symbolises the concentration of thoughts towards the liturgy. 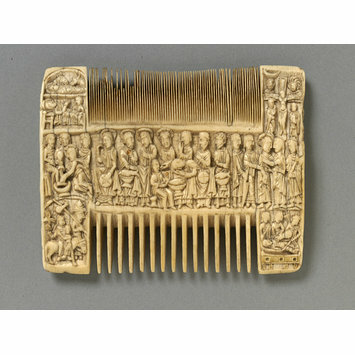 The comb is carved on both sides and on the narrow ends with scenes from teh Infancy and Passion of Christ, without following a logical narrative sequence. The four corners of one side of the comb depict: The Nativity, The Flight into Egypt, Crucifixion and the Entombment, while the central space - on a larger scale - shows The Washing of the feet of the Disciples, The Last Supper (with only eight apostles) and the Betrayal. The other side shows the Massacre of the Innocents, The Adoration of the Magi, The Dream of the Magi and the Annunciation to the Shepherds. The end of the comb show a continuation of the Annunciation to the Shepherds and the Soldiers on guard at the Sepulchre. A number of the smaller teeth are broken. Collection of Mrs. T. L. Barwick-Baker (Hardwicke Court, Gloucestershire) before 1861; Miss Olive Lloyd-Baker, who placed it on loan to the Victoria and Albert Museum from 1926 to 1939. On loan to the City Museum, Gloucester, after the second World War; again on loan to the V&A, 1967-77; accepted from H.M. Treasury in lieu of capital transfer tax after the death of Miss Lloyd Baker, in 1977. Historical significance: The crowded compositions with rather stiff figures, mainly seen in profile, are related to the St Albans Psalter, executed c. 1120-30 at St. Alban Abbey, now in the Dombibliothek in Hildesheim. The stylistic and iconographic relationship of ivories and manuscripts illustrates well the close connection between works produced in different media in one place. A second comb, in the Musée de la Princerie in Verdun, was probably executed in the same workshop but by a different hand. Williamson, Paul (ed. ), The Medieval Treasury: the art of the Middle Ages in the Victoria and Albert Museum, London, Victoria & Albert Museum, 1986 (reprinted in Hong Kong, 1996), pp.110-111.